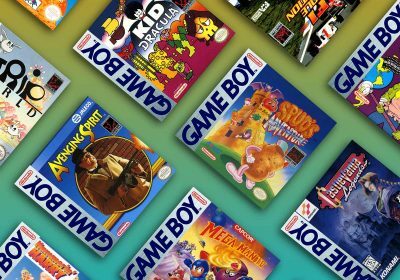 Note from racketboy:The RetroGaming 101 series is aimed at gamers who are just starting out in the classic gaming scene or are curious about an older console that they don’t know much about yet. Of all the things Nintendo did wrong in the 1990s, Virtual Boy was perhaps one of the biggest disappointments. 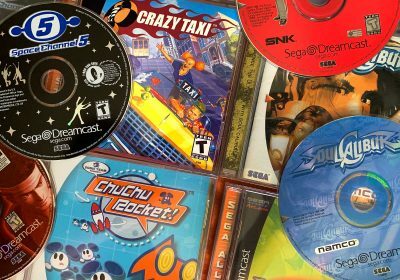 It was a rushed product, doomed by gaming magazines before being released to appease a market that was demanding a 64-bit console while both Sega and Sony waited in the wings with CD-based technology. Just a part of a string of problems that Nintendo began facing in the decade, Virtual Boy was perhaps the most obvious starting point to the general public. Eventually Nintendo would recover, but not before losing one of the company’s most important designers amongst a slew of other defections from various supporting companies. Originally known as the VR-32 while in development (or the “Virtual Utopia Experience” at the earliest concept stages), the Virtual Boy was rushed through development, against chief designer Gunpei Yokoi’s wishes, to make up for the slowing development of the Nintendo 64. At the time of development, low-costing green and blue LEDs had not appeared on the market yet (they would in 1996 from Nichia Corp.), and LCDs were not advanced enough for what Nintendo required and proved to be too expensive, so red LEDs were chosen for Virtual Boy’s screen, hence why everything is in red. Virtual Boy was released in Japan on July 21, 1995, and North America August 14, 1995, a few months after the release of the Sega Saturn. 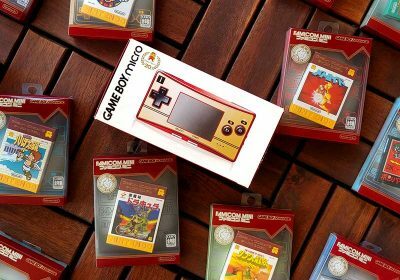 The console, claimed to be a new 3D portable gaming device, unveiled at $180.00 on release, with games coming in at $40.00. Despite distribution deals with Blockbuster Video and numerous price drops, it tanked. 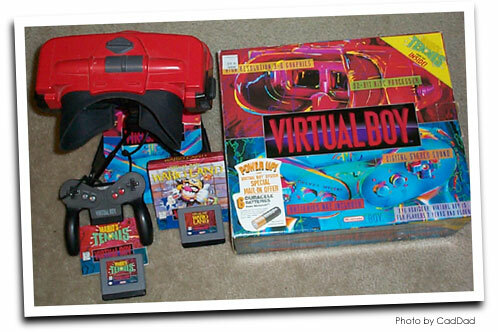 Nintendo pulled Virtual Boy off the market in 1996, just a year after its release. Only 770,000 units had sold worldwide, and only 800,000 had been shipped. This would serve as Nintendo’s only true failure as a hardware developer since they entered the video game business, though it would be a major one. The console is often named as one of the worst in history. The father of the Game & Watch and Game Boy, Gunpei Yokoi, was blamed for the failure by Nintendo and left the company shortly afterward. He would go on to begin developing the WonderSwan handheld for Bandai, but would die in an automobile accident several years before its release. Due to its limited release, the machine has become a collector’s item. Came with a built in feature to tell the player to take rests every 15 to 30 minutes. Game selection is limited, so building a complete set isn’t too difficult to do. 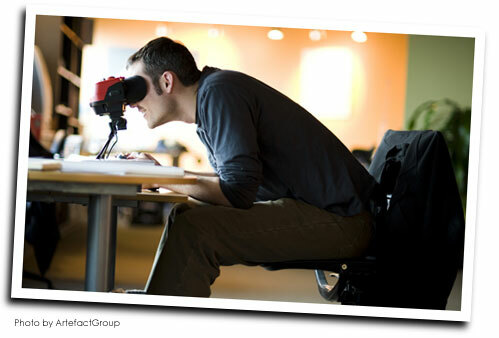 The console shields the eyes, so external visual distractions are nil, allowing the viewer a better experience. 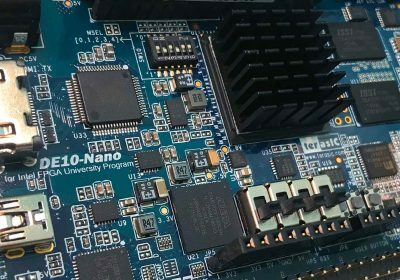 There is a homebrew community interested in manufacturing new games and peripherals for the console. Most games featured controls that were reversible, allowing ease-of-use for left-handed gamers. Uses the same 9V AC Adapter as the NES and SNES, so finding replacements can be easy, though a special tap is required to plug in the Adapter. Also operates on six AA batteries, housed in the controller. It is unwise to allow children age 7 or less to play the Virtual Boy, as it may limit the growth of their eyes and lead to permanent damage. The Virtual Boy is known to cause headaches in people using it, due to the heavy use of reds and blacks and the limiting of external light. Other symptoms include eye strain, nausea, dizziness, and blurred vision. Be sure to take breaks while playing. Multiplayer is practically nonexistent, and though an extension port was built in, no connecting cable was ever produced. 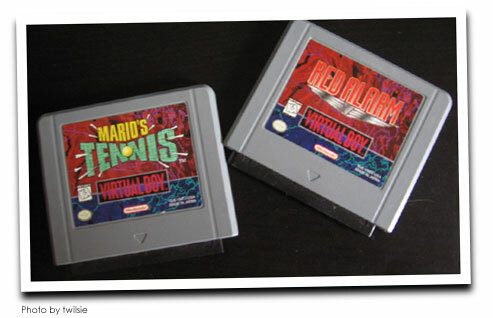 It is possible to modify other cables to work in a Virtual Boy, though only a couple of games were built in the possible eventuality of multiplayer, and only one homebrew game currently utilizes it. Because of the eye-shield, it is also not possible for any kind of audience to watch games. The console wasn’t really portable, since it requires the total usage of one’s eyes and needs a level surface. A shoulder harness was being designed by Nintendo, but never made it to market. Comedian Nathan Barnatt (of Keith Apicary fame) has designed a head strap for the Virtual Boy, though with mixed results. The console also doesn’t offer true 3D, merely using red LEDs to trick the eye into seeing a three-dimensional object on a 2D screen. Not only is the game library small, it can also be expensive, with prices ranging from $2.00 to nearly $60.00. To make matters worse, some of the games are considered quite poor, especially Waterworld, which is thought to be a contender for the worst game ever made. Since the player can’t see the controller, locating buttons can be difficult. The controller can also be heavy since it’s housing multiple batteries. Getting replacement parts for Virtual Boy can be difficult due to its rarity. The console also makes a noticeable humming sound when turned on, due to the oscillating mirrors inside rapidly vibrating. The Virtual Boy’s CPU was a NEC V810, with a 32-bit RISC Processor clocking at 20 MHz, and 1 KB cache. The console featured 128 KB DRAM and 512 KB P-SRAM, according to Planet Virtual Boy. It features Reflection Technology Inc. SLA dual-mirror scan, and uses a red LED display. The display is 332 x 224 resolution, with a 50 Hz horizontal scan rate. LEDs are reflected off the oscillating mirrors, one for each eye, to produce the 3D illusion. Sound is handled via a built-in 16-bit digital stereo speaker. The console required six AA batteries for 4 hours of playtime. A separate tap for a 9V power supply was also released. There are several different designs for Virtual Boy, though these are mostly from models used as store displays. There were three different display sizes used in America: the “floor model,” “counter model,” and “platform display.” The floor models and counter models were also used in Japan. Functionally they are no different from commercially released Virtual Boys in those regions. The Virtual Boy did not last long enough for major hardware changes, so the primary difference in hardware is based on region. Region-locking is nonexistent beyond the language barrier. Of course, the Virtual Boy is a rather unique experience that isn’t easily replicated without the orignal hardware. However, if you want to play the games on your computer or other devices without getting headaches, here are some emulators to check out. Virtual-E is a Windows based emulator of the Virtual Boy that has been in development since 1999 by Alberto Covarrubias. While in constant development for the first few years, it unfortunately appeared to have been put on hiatus after its initial release. The development site did not update from 2003 to 2008, and hasn’t updated since. However, the project also included discovering a method to hook a Virtual Boy to a PC via the IO port to generate a 3D image on a computer screen. The project website can be found at http://www.emuunlim.com/VirtualE/. Reality Boy is a DOS, Windows, and Linux based emulator, developed by David Tucker. It started development as early as 1997. It features a decent front end and quality emulation. Unfortunately for various reasons the project falls in and out of development from time to time, though the creator has been busy attempting to port it to the Xbox and other locations. The source code is also available freely on the web. At 86% compatibility, it’s supposed to have the highest rate. The project website is http://www.goliathindustries.com/vb/. It was originally known as VB-98. Red Dragon, besides being the best-named emulator, is also the most prolific, with versions for DOS, Windows, Linux, and PSP. A spin off from Reality Boy, it’s not as compatible(around 82%), but does include features like save states, some sound emulation, and a debug menu. At one point this was the best Virtual Boy emulator, though it appears to not have updated since 2004. ViBE was unveiled in 2008 by Gil Pedersen and Richard Bannister. It is currently the only Mac emulator for the Virtual Boy. While it emulates quite well, it’s not fully compatible with all the games(around 59% of the library is playable). With any luck the project will continue and there will be future updates. Additional emulators are VirtualBoyX, an Xbox emulator released in 2007, XVBoy, another Xbox emulator currently in beta, and VUE32, a project that was being developed by Parasyte, one of the creators of Red Dragon. Unfortunately it appears to have fallen by the wayside and its project website no longer exists. When purchasing a Virtual Boy, it is important first to test the unit and guarantee that both screens are working properly. The most likely spot for trouble is in the oscillating mirrors, since they can break easily if the machine is mistreated. These produce a mechanical hum when the machine is powered on. Another problem with the Virtual Boy is the weak adhesive used to connect the PCB to the LED array board. This has a bad tendency to rot away or fail with age, loosening the connection and causing one of the screens to suffer problems when in play. It can be fixed at least temporarily with some well-placed scotch tape. Certain replacement parts did make it to market, such as replacement eyeshades, though these accessories were mostly limited to Japan. Unfortunately many of them never came out at all, such as Nintendo’s planned adjustable stand made out of steel. 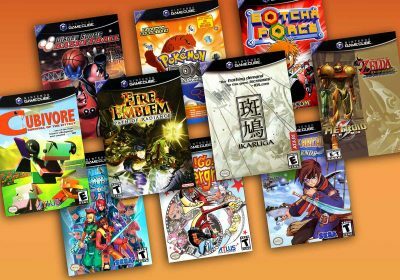 One strength not mentioned is that, because of it’s very limited library, many titles consisted of first-party titles and as a consequence the system has a very favorable ratio of good to bad games. An extra period is attached to the troubleshooting link at the end of the article, by the way. It’s worth mentioning that Gunpei Yokoi had reservations about the system and didn’t want it to be released when it was. Nintendo, however, wanted a holdover before Nintendo 64 was released and ushered it to the market. The system was Yokoi’s idea, of course, but where it was poor in delivery, it was sound in concept. Issue 64 of the UK magazine Retro Gamer had a good article on Virtual Boy. More trivia on the “Father of the Gameboy” aka book “The Ultimate History of Video Games.” At the Shoshinkai trade show during the grand showing of the N64, Gumpei Yokoi was placed out of the way in a small corner booth, punished to demonstrate the embarrassing Virtua Boy. After his death, one of the first games on the Bandai Wonderswan was called Gunpei. I was there during the North American unveiling of Virtual Boy at the 1995 Winter Consumer Electronic Show (WCES)in Las Vegas. For the first-time online I reveal footage of what could’ve been a Super Mario VB and Starfox game. The footage is kinda rough because photography wasn’t allowed inside the mini-theatre Nintendo built for the VB Demo presentation. Wow, glad I picked one of these up on ebay back in early ’07. Got it complete with Blockbuster case for $30! I love the system for its quirkiness, and WTF factor when friends come over. Most of the games are meh, but I have had real fun with both Wario Land and 3D Tetris. It’ll be interesting to see when 3d gaming becomes more common (see the Avatar game) if it gets incorporated into any VirtualBoy emulators. I think it may be important to state that battery packs can be hard to come by and especially pricy for the VB controller. The Plug attachment isnt especially easy to come by either from my experience. “If you want to save a little money you can one with that might be missing the stand or have some minor issues for $25 to $50” ? Best feature the Virtual Boy has to offer. Did anybody know anyone who owned one of these? Everyone I knew growing up had Nintendo consoles and nobody had a Virtual Boy. I know I wanted one though. Hrm? The US NES uses an adapter that puts out 9 volts AC and the SNES adapter puts out 10 volts DC. The tips are completely different. Hobie, I am pretty sure it’s just the SNES adapter. I checked my NES and SNES and they are nothing alike, but my VB and SNES adapters are identical. I wish to perchase a new/like new nintendo Virtual Boy complete. Im watching the prices/ quality and expect to pay $ 80. compete. any available out there? Actually, the Virtual Boy DOES show “true 3D.” That is, if you consider stereoscopic 3D to be “true 3D” (which it is). Two separate images are generated, one for each eye, and the combination of them by your brain produces a stereoscopic 3D image, the same thing you would find on modern-day shutter glasses like Nvidia’s 3D Vision or even passive polarization technology like RealD 3D in theaters. Yes, the images were entirely in shades of red, but that doesn’t say anything about the 3D capabilities of the system. Games on the Virtual Boy truly have a sense of depth to them, even though some games do a better job at showing off the 3D effects than others. Please edit your description because what you said is simply not true. Thanks. I loathe the VirtualBoy — my brother actually got one second-hand back in ’98, and I tried it out. The VirtualBoy gave me massive headaches, and I promptly made my brother throw out the damned thing. 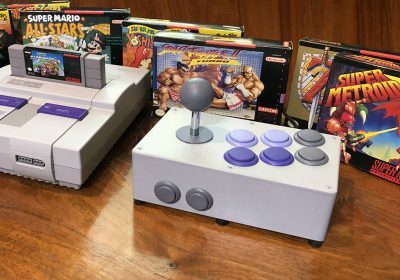 When an older brother (and lifelong Nintendo gamer up until that point), makes his lil’ bro chuck a Nintendo system to save him from permanent eye damage, it’s very telling. Flat-out, the VirtualBoy was and still is dangerous, and the 3DS is following in the VB’s footsteps. I find it hilarious the SAME exact warning of ‘Not for kids under 7 and/or people with weak eye muscles’ is being used for the 3DS. Anybody else seen the 3DS startup screen with the 3DS logo? It has that nasty, stereotypical offset red-on-blue 3D layering goin’ on (even the 3DS startup screen is dangerous). Wasn’t the loss of disgraced NOJ-ousted Gunpei Yokoi enough? The dude responsible for the Gameboy and Metroid series died for the VirtualBoy system. STILL want a chance to experience the Gunpei Yokoi-killer and ruin your eyes? Try out some VB roms on your computer. It’s just as damaging, with no Ebay bullsh*t involved! I just pulled mine out of the attic where it was for a few years. The right display is fuzzy, grainy and has some lines going through it. I looked over some FAQs but couldn’t find anything concrete. Blockbuster, what did you do with all those Virtual Boys that you demo for?